Hello! 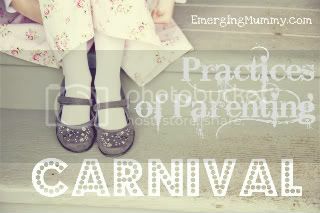 Sarah is one of my favorite internet writers, and today she is doing a Practices of Parenting Carnival (!) which sounds quite celebratory and rakish. She invited anyone and everyone to write about their own best practices of parenting, so here I am. It is always nice to have a little push in a direction for writing a post. I am trying to live into God's call for my life. Now, doesn't that so spiritual and awesome? From a young age, I have dreamed of being an apostle, an evangelist, of living out all those crazy stories in the New Testament. I loved Jesus and I wanted everyone to know about him. I read missionary biographies extensively, and never once considered an alternative to the wandering, nomadic, Bible-preaching life. But what happens when an fired-up young single woman missionary falls in love and gets married? And then has a baby (a preemie, high-needs baby at that)? And then gets a good job? And then, and then, and then. One of the most difficult transitions to motherhood thus far has been the perception that my life now revolves around the baby. Which, to be fair, it totally does (the baby happens to be very, um, particular about naptimes and bedtimes and routines and all that, much to my chagrin). But just because I might be in a relatively short period of my life where I am sleep deprived and getting re-acquianted with Sesame Street characters does not mean that my earlier callings are somehow over. I am still called to be a strong, missionary woman. But now, I have a baby on my hip. And believe you me, some things have changed. I can't do as many crazy refugee adventures as I used to, nor do I have all the spontaneity that is often required for non-Western celebrations and events (which can last for 14 hours or MORE). It now takes much more effort, planning, and intentionality to make things work. For awhile, I taught English classes for refugee women in my apartment complex while wearing the baby in an Ergo carrier. Nowadays, that doesn't fly for the baby, so instead I invite all the neighborhood kids over for an after-school play time. It is messy, loud, chaotic--and so much fun. While there has been a stretch of a month or two at a time where I feel like my vision becomes narrowed, thinking only about bills and how many hours I spent awake in the middle of the night and whether or not the baby will ever start walking--coming back to camp on the promises that God has given me has been vital. This time right now, the longest/shortest time, is yet another dimension of my calling. My first calling is not negated, nor do I need to abandon it. I think about my mom, someone who was always thirsting for God, and how I absorbed the immense importance of that relationship. My mom spent an hour every morning walking and talking to God, and my childhood was spent being taken on various adventures: to the wild islands of Alaska to work with natives, to the depths of rural Mexico, to the homeless shelters and Special Ed classrooms and Bible studies in whatever city we lived in at that moment. And because my own mother was obedient to her first calling, that of a Christ-follower, my own growing-up felt magical, exciting, infused with the excitement of bringing the kingdom. So here I am, struggling to live out my missional life. It is hard work to beat back the trappings of Western motherhood, the isolation and perfectionism, the consumerism and the incurably inane. And then I go back to my calling, the ones I received as a little child and a tearful teenager and a depressed young-twenty something. The calling to live for others, and not for myself. The calling to bring a kingdom of justice and love and mercy. The calling to surround myself with the least of these, lest I get too comfortable. The calling to choose to actively be a part in all that the Spirit is doing now, and to not content myself with what is easy and temporary and crowds out the voice of God. We are trying to live out our callings over here. What are your Practices of Parenting? Come check out the Carnival!